LOUDON, N.H.—The Magic Mile gave Kyle Busch a chance to show his mastery. 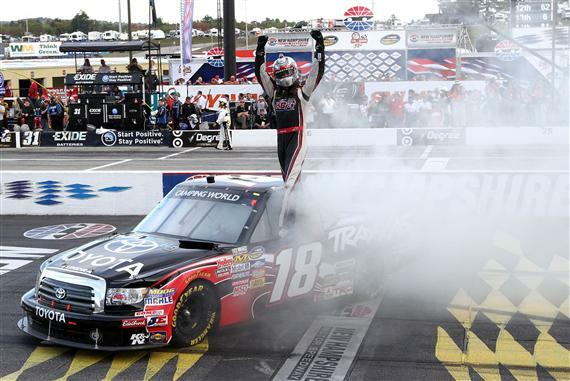 Busch started from the pole and dominated Saturday’s F.W. Webb 175 at New Hampshire Motor Speedway, a race in which only six Camping World Truck Series entries finished on the lead lap. Busch, who led 165 of 175 laps, crossed the finish line 3.816 seconds ahead of runner-up Austin Dillon to post his sixth win in 14 starts this season and the 30th victory of his career. Kevin Harvick finished third, followed by Ron Hornaday Jr. and Johnny Sauter. Busch led the first 130 laps and didn’t surrender the top spot until he came to pit road for tires and fuel on Lap 131. That handed the lead to Dillon, who didn’t pit until Lap 135. By the time pit stops cycled through, Busch had opened his advantage over Dillon to nearly six seconds. Harvick was running third at that point, more than 12 seconds back. Busch had led every lap in a Nationwide race at Phoenix earlier this year, but both he and crew chief Eric Phillips said the prospect of doing that in two different series in the same year didn’t affect their decision to pit earlier than Dillon did. "I never thought of that, actually," Busch said. "But that’s cool. Certainly, Phoenix and Loudon, when I can hit it right, I can hit it right. The cars are really, really good. Today was no different. I don’t know what Eric’s strategy was to pit—I won’t say that early, but to pit early." Phillips didn’t want to see a repeat of last week’s race at Chicagoland, which Dillon won. "I came early, because I didn’t want to see what we tried to do last week, taking two tires," Phillips said. "I think we had about 13 seconds on third, when I decided to come to pit road, and Austin was right there with us. So I felt like, if I came early, that would kind of force Austin’s hand and some of the other guys. "Kyle was really good getting on an off pit road, and we were able to run a second faster almost for about eight laps there before Austin pitted, and we had almost (six) seconds when it finally cycled between us. That paid off." Though Dillon closed the gap over the final 30 laps, Busch was able to cruise to the win, breaking a string of five straight Chevrolet victories in the series. Dillon now is atop the truck standings by two points over James Buescher, who finished seventh, the first driver one lap down. Over the closing laps, Dillon kept the big picture in mind—his quest for the series championship. "I wish we could have come out a little closer to him off pit road," Dillon said. "I lost a little time getting onto pit road, and that hurt us. But we came out leading the points with six (races) to go. We’ll focus on that, and we’re happy with this finish."